President Rodrigo Duterte maintains its satisfaction rating "very good" for the first quarter, garnered 70% of 1,200 respondents nationwide. A point lower compared to the last quarter in 2017. 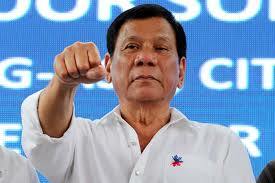 Social Weather Stations showed that the latest statistics, Duterte remains the most trusted high ranking leader in the nation. He maintained a “good” to “very good” rating in Metro Manila (+54), Balance Luzon (+39), and Visayas (+65). The nationwide survey conducted from March 23 to 27, 2018.